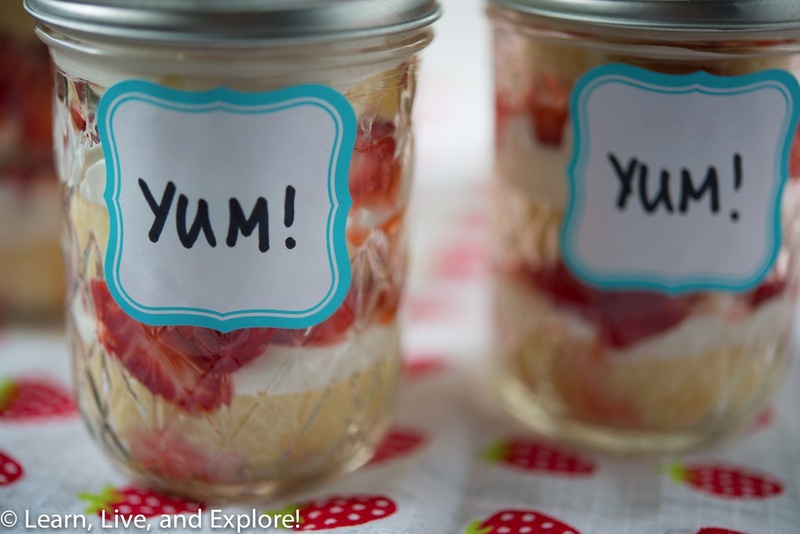 Layered Strawberry Shortcake ~ Learn, Live, and Explore! Sometimes you get invited to dinner and offer to bring dessert. And sometimes the day of the event arrives and you don't feel like baking. And sometimes you need to think of something healthy because everyone is watching what they are eating. In all of these cases, can I suggest an extremely simple, yet delicious option? 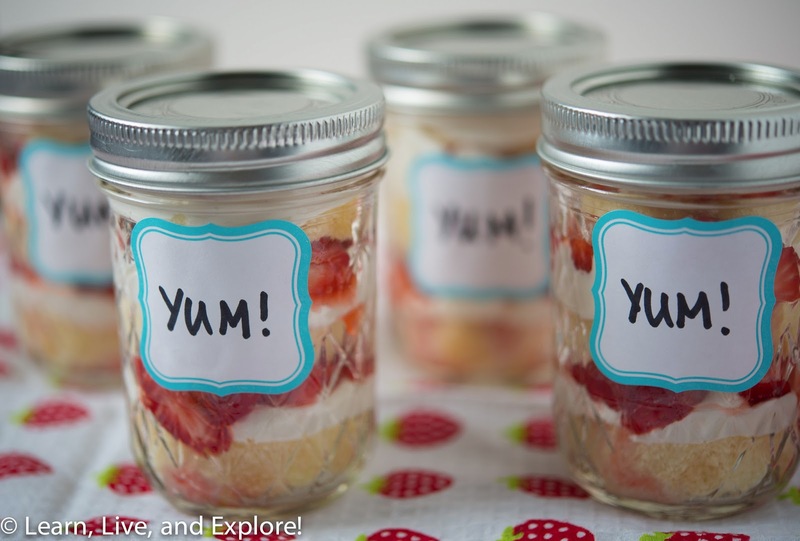 Individual low-calorie strawberry shortcakes! 2. They take less than an hour to make: cut the strawberries into small, quartered slices and sweeten with your preferred low calorie sweetener (I like Truvia). Slice the pound cake, then use a circle shaped cookie cutter to punch out shapes (you need 3 per jar). Put the cool whip and the cut strawberries into disposable piping bags to keep the mess to a minimum - no tips needed, just snip the ends with scissors, giving a larger opening for the strawberries. 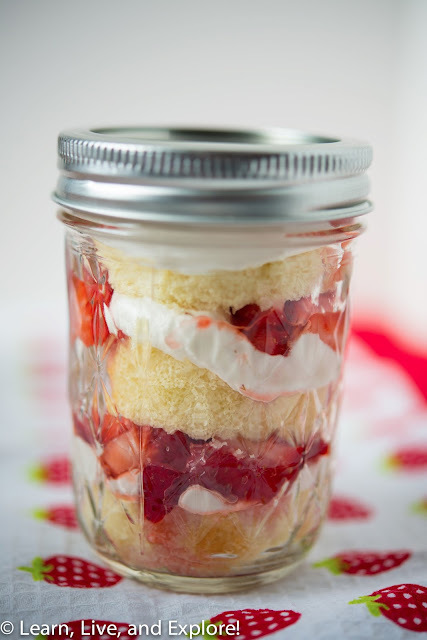 Layer in this order in a small jelly jar, using an assembly line technique: pound cake, whipped cream, strawberries - repeat to make 3 layers. 3. Low in calories: because of fat free cool whip and the artificial sweetener. I like a buttery pound cake, so I didn't scrimp there, but after all the cutting, you're really only eating about 1-1.5 slices of the cake. It's all about portion control, and this glass jar presentation seems like you're getting a lot when you're really not. To make 4 strawberry shortcakes, I needed almost one tub of whipped cream, almost one quart of strawberries, and the family-sized pound cake because I sliced the cake thick and you end up losing a lot to excess from the cookie cutter. Think about cubing the pound cake if you don't like excess cake. ENJOY!